The Motorola Droid Razr HD was announced in September 2012, and is available exclusively on Verizon in the US. The smartphone features a 4.7-inch 720p screen, 1.5GHz dual-core Snapdragon processor, and NFC. The Droid Razr HD ships with Android 4.0 but is user upgradable to Android 4.1. 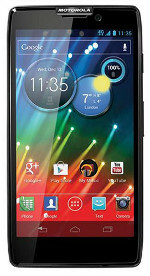 Find out more at Motorola’s Droid Razr HD page.